Tonight we are participating in a U-Brew class at PUB (Portland U-Brew & Pub)–Ktams has had an interest in home brewing for a while, and I plan on winning the Spouse of the Year Award for finding and purchasing this Living Social Deal for him. Back to something we can agree on–You are going to want to hug me at the end of this post. Mostly because I’m about to share with you one of our favorite weeknight meals. It’s your protein, carb, and veggie in one dish! AND it’s ready in under an hour! I love those. 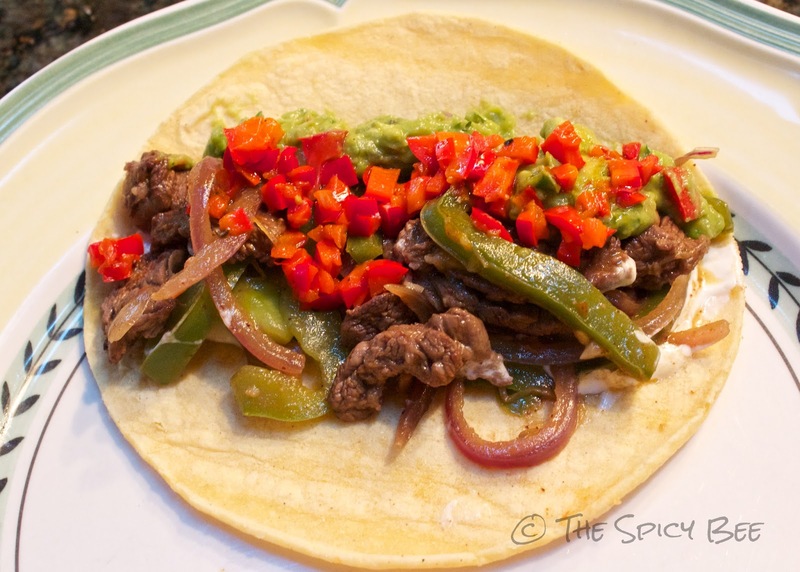 You could also have this with spanish rice if the corn/wheat tortilla doesn’t suffice. Recipe after the jump. 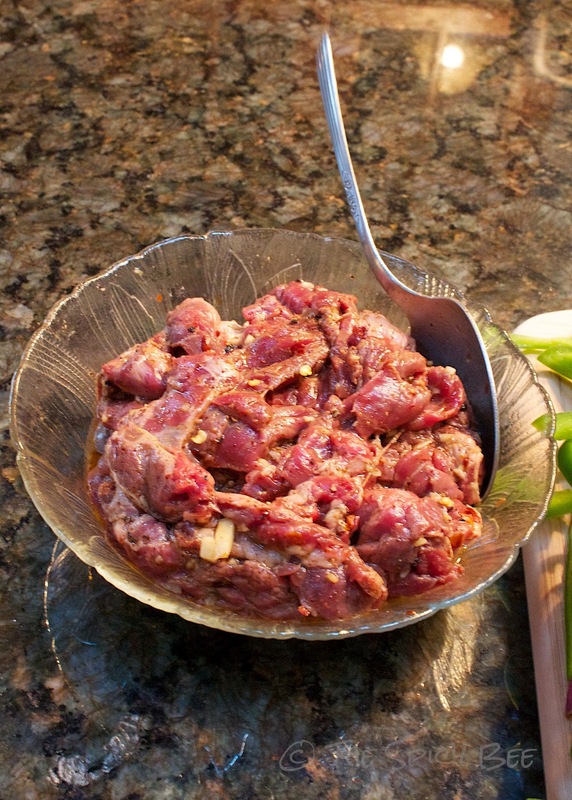 Marinate the beef in 1 tablespoon olive oil, lime juice, garlic, and spices for 30 minutes (up to 3 hours). 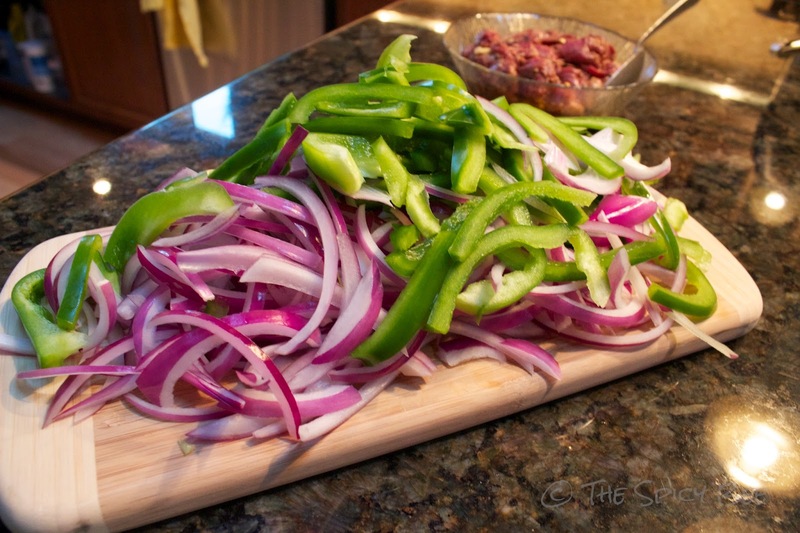 Thinly slice the red onion and green pepper. Excuse the man hand in the picture. No, I wasn’t on that one episode of Seinfeld–it’s my husband’s hand. 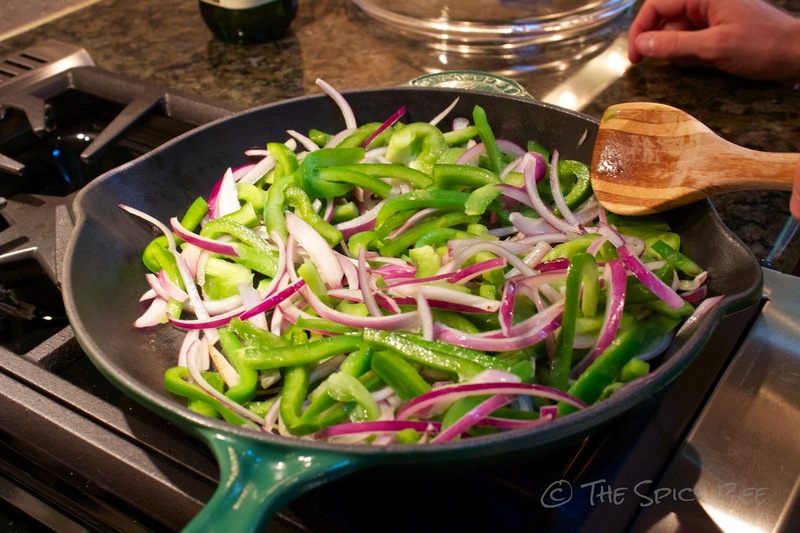 Heat the pepper and onion in a pan with the other tablespoon of olive oil over medium heat until onion is translucent but pepper still has crunch. 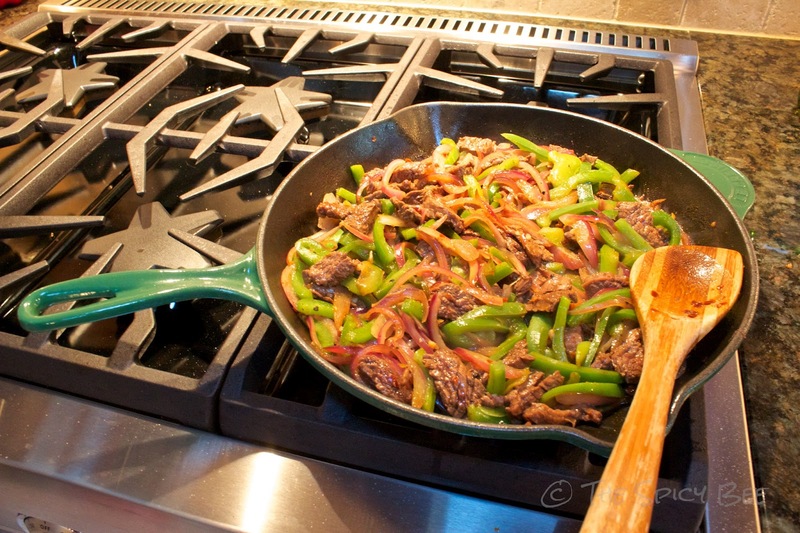 Set veggies to the side and toss the marinated beef into the hot pan, turning continuously until cooked through. At this time it would also be helpful to warm the tortillas in foil (with a wetted paper towel) in the oven. We do ours in the toaster oven on a toast setting for 5-8 minutes. Combine the veggies and beef and toss together. Remove from heat and prepare to serve on corn or wheat tortillas. 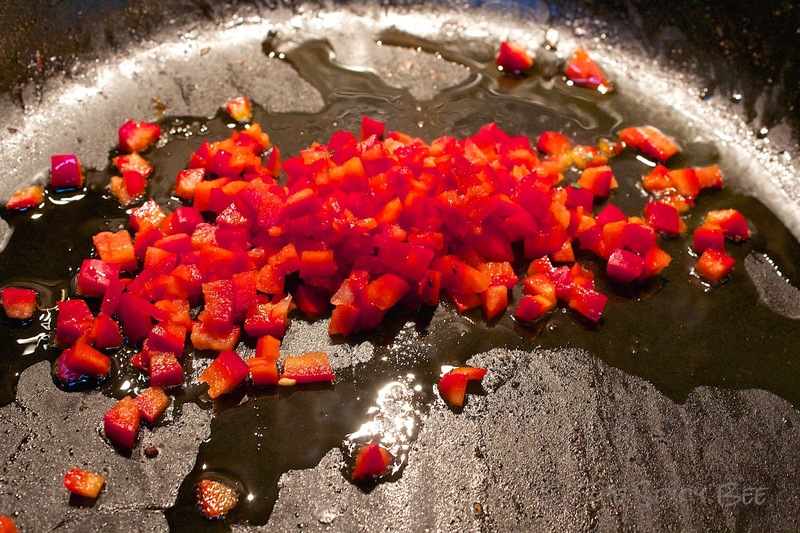 At this time you can grab your minced hot pepper and some olive oil and toss over medium heat for 1-2 minutes. YUM! I always thing fajitas go with everything… especially beer. Lots of luck with your home brew class 🙂 I hear the secret is in the yeast. YUMMY!!!!! I’m going to have to make this ASAP!